With the Halloween there will be lots of things going wrong especially if there is a zombie breach. Keep in mind that things will go wrong for them as well given that you will protect your base. Have fun trying to kill all of them with your combat moves but also when things go rough you can call the cannons to take care of the zombies. Make sure you get your mana bar filled up before doing so or else it will not work. Use your special powers when you have them upgraded and also call on backup thugs that will fight for you and keep the wave still. 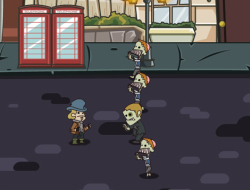 Depending on which lanes the zombies come you will have to constantly move up and down. Use WASD to move, JKL to fight and Space to activate powers. Press the number keys to call backup. Zombie Breach 0.00 between 0 and 10 based on 0 votes.